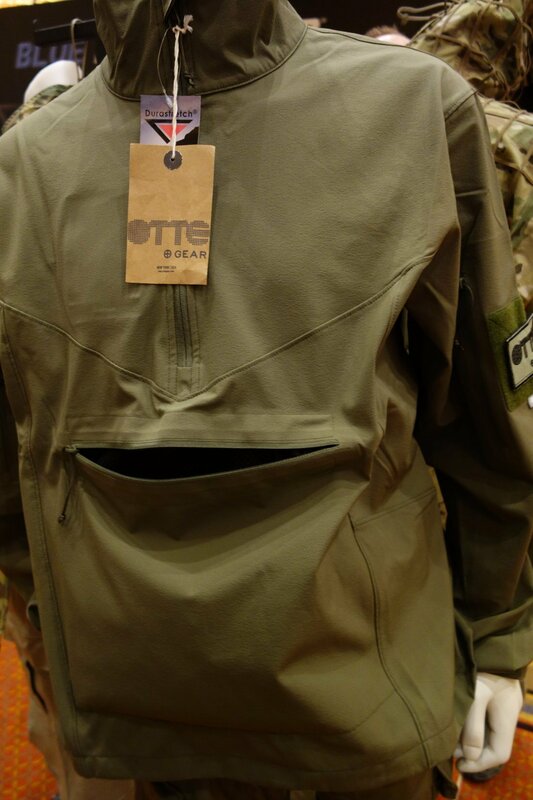 Otte Gear (OG) Sentinel Anorak Softshell: High-End Lightweight Pullover Combat/Tactical Jacket with Kangaroo Pouch for Lo-Pro/Lo-Vis Special Operations and Gunfighting with your Tactical Rifle/Carbine/SBR (Video!) | DefenseReview.com (DR): An online tactical technology and military defense technology magazine with particular focus on the latest and greatest tactical firearms news (tactical gun news), tactical gear news and tactical shooting news. 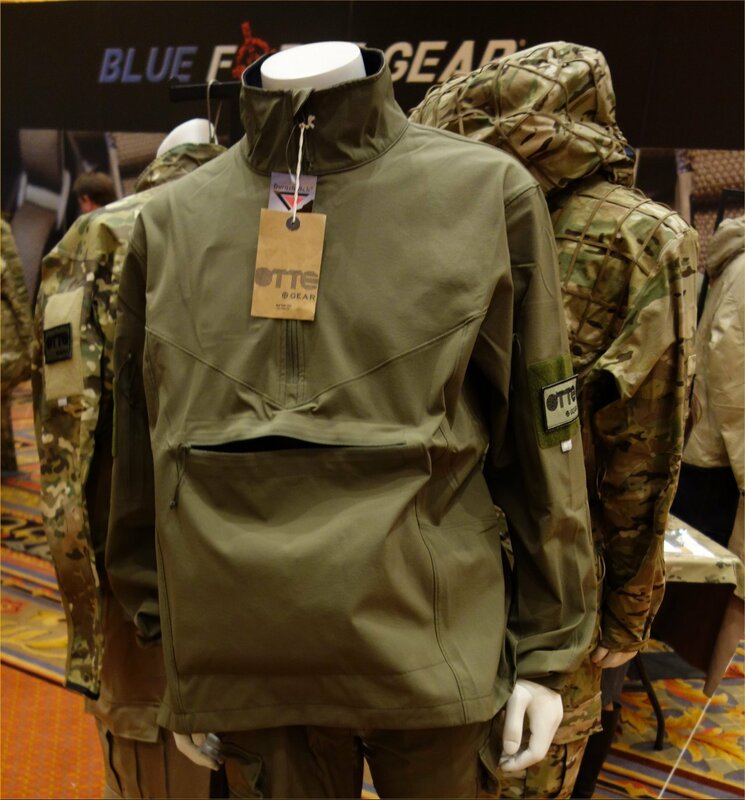 Otte Gear (OG) has a new tactical anorak/combat anorak called the Sentinel Anorak that DefenseReview (DR) recently got to try on and examine at SHOT Show 2013. Currently available in Ranger Green, Desert Tan and Black, the Otte Gear Sentinel Anorak is an easy-to-pack lightweight pullover softshell tactical jacket (31 oz/879 grams) designed specifically for lo-pro (low-profile military Special Operations (including covert ops) and personal security detail (PSD) security operators that need to operate lo-vis (low-visibility) while running a tactical armor plate carrier (body armor) with rifle mags (magazines) underneath it. As such the Sentinel's most obvious and mission-specific feature is the kangaroo pouch that provides a tactical operator (or civilian tactical shooter) direct access to his mags on his plate carrier. He can conduct speed realoads by simply reaching in and pulling his mags, making the Sentinel really a gunfighting jacket. The OG Sentinel Anorak also sports a zipper runing the length of its right side to allow easy access to your secondary weapon, i.e., your pistol, and has a dump pouch on the back of the jacket. The jacket's "lightweight, highly-breathable fabric dries quickly" and aids wearing comfort. Looking at all it's feature's (detailed below), the Sentinel's a really slick design, as well as a natural and logical follow-on to the Otte Gear Recce Anorak, which was designed and developed specifically for military snipers. The Sentinel Anorak utilizes the same sophisticated design aspects and technical materials (high-tech fabrics/fibers) as the Recce. Speaking of the Recce Anorak, DR detailed it back in August 2011, after the design really impressed us. That article contains all the info on the OG anoraks' design history and technical materials. It's the combination of advanced, sophisticated design, attention to detail and high-tech fabrics/fibers that make Otte Gear's combat/tactical jackets truly state of the art. – Packs down into a rucksack. – Stand-up collar fits snugly around the neck, keeping debris out. – Loop on sleeve pockets for patches. – Large dump pouch on the back of the jacket. – Right side unzips from hem to elbow for easy access to sidearms. – Lightweight, highly breathable fabric dries quickly. – Fabric provides abrasion resistance. – DWR protective finish keeps the jacket water resistant and repels stains. This technical stretch-woven anorak, little brother to the Overwatch, is geared for missions where discretion and blending-in are priorities. However, the Sentinel also allows the operator to go full-power in a heartbeat. Gov. Rick Perry and DR’s David Crane Tactical Jacket and Gun Buddies? Rick Perry does some combat pistol shooting while wearing Triple Aught Design/TAD Gear Recon Hoodie combat fleece jacket and shoots LaRue Tactical OBR/OSR-type 7.62mm/.308 AR rifle/carbine at the range.